These deals are just too good to refuse. Even if you haven't got immediate plans to visit Australia, chances are you will at some stage in your lifetime. Statistics have shown that 'down-under' is the preferred destination for Singaporeans when planning that well-earned vacation. I strongly recommend that you bookmark the Stay247 website for future reference. This is where 'Stay247' can be of enormous benefit. Whenever I travel back home, I no longer have a residence or house in which to stay, so I want to budget into a hotel I can afford. However, I don't want to stay in just any 'cheap and nasty' accommodation - I want to live it up a little, but at the same time I don't want to spend an absolute fortune doing this. Most of us will plan our vacation months in advance, which gives us the opportunity to take advantage of cheaper airfares (including budget airlines). Historically, travel agencies and online travel websites and hotels will not allow for heavily reduced rates or discount packages by booking way in advance - this means that although you might get a cheap airfare, the savings are all but blown by having to pay full price (or near to) for accommodation - if you can book the accommodation in advance with the opportunity for reduced prices, the $$ can be redirected to your pocket, or reinvested into other components of your vacation - whichever way, Stay247 is the only travel website where reduced accommodation rates or huge discounts can be monopilized even up to four(4) months in advance. So why is Aussie Pete dedicating an entire blog article to promote a travel website? Very good question indeed, and the answer is two-fold... Not only am I impressed by the unique opportunity for 'future-based' reservations offering discounts that no other travel agency or even the hotel themselves can offer, but the owner and MD of Stay247 is a very old and loyal friend of mine (I should rephrase, Brent Cooper is not old - in fact he is quite young to be running such a successful business, it is our friendship that is old, and spans over two decades). Brent is commonly referred to as the 'Crocodile King'... a name that is also one of the key reasons that he is able to negotiate deals within the Australian travel industry that no-one else can. The name and connections are as a result of his extensive experience and realtionships forged over numerous years as the Director of Sales and Marketing of (the then) Club Crocodile resort in the Whitsunday Islands in Queensland (oh my god, what a beautiful part of the world that is!!) and the Ocean Capital Group. "Youthful local bizzoid Brent Cooper has exchanged his crocodile skin shoes for the alluring world of the internet. After 12 years hosting functions on board the old Kookaburra Queens, overseeing resort development, dealing with the travel sector and feeding the odd crocodile, tourism chief Cooper has thrown his weight behind a new online accommodation business. 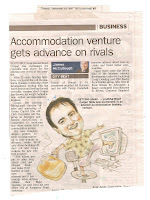 Coops, the previous fishing-mad director of sales and marketing of Ocean Capital (the old Club Crocodile) left the group in February and formed stay247.com, a competitor to wotif.com and other online hotel accommodation groups. His new company allows punters to book accommodation up to four moths in advance, while wotif only allows bookings 28 days out and Coops reckons the new venture is a goer. 'This allows people to plan long ahead and get cheaper deals and make their holiday or business stay pleasant and it has synergy when airlines release their flight specials' he said from his new office HQ at Kangaroo Point yesterday." Like I said - bookmark this site... I've been watching the site for a while now, and the savings are actually incredible. Once you visit the site, you can sign up (for free) and get the latest deals and offers delivered monthly to your desktop via email. TIME FOR A BREAK?? - VISIT247.COM!! "A new entrant to the online travel market is out to challenge another trend that is entrenched in the Australian market: a tendency to book air fares well in advance but hold out until the last minute for cheap accommodation deals. http://www.stay247.com/ is offering discount hotel rates up to four months out, while most of its competitors are focusing on last-minute sales of unsold hotel rooms. Managing director Brent Cooper says the strategy will bring online hotel bookings in line with advance-purchase discount air travel and will broaden the discount travel market."